"What should be the conversation now about sexual harassment?" That's what Charlie Rose asked New York Times reporter Jodi Kantor on October 20, in a "CBS This Morning" segment about the Harvey Weinstein scandal. Now, Rose himself is out as a morning host after facing sexual harassment allegations of his own. Like every journalist these days, Rose spent a lot of time talking about the harassment stories that have been making headlines. Here's some of what he's said. When Roger Ailes died in May, Rose hosted a panel on his PBS interview show to discuss the Fox News founder. "Let's assume all of the things that ... tainted Roger Ailes' career, all the sexual harassment stuff, had not been there," Rose said to journalists Gabriel Sherman and Jim Rutenberg. "What would be his legacy?" Fast forward to 2017, and Weinstein stands accused of sexual harassment and assault by dozens of women after reports in the New York Times and the New Yorker. "Is this just the tip of the iceberg we're seeing? Is there some sense there's a lot of other things coming out in this story?" Rose asked Kantor, who co-wrote the Times' Weinstein investigation, on "CBS This Morning." In a segment on Rose's interview show, the anchor spent more than 10 minutes discussing Weinstein with Tina Brown, the former editor of Vanity Fair and The New Yorker. "Why didn't this come out sooner?" he asked. And later: "What happens to him now?" 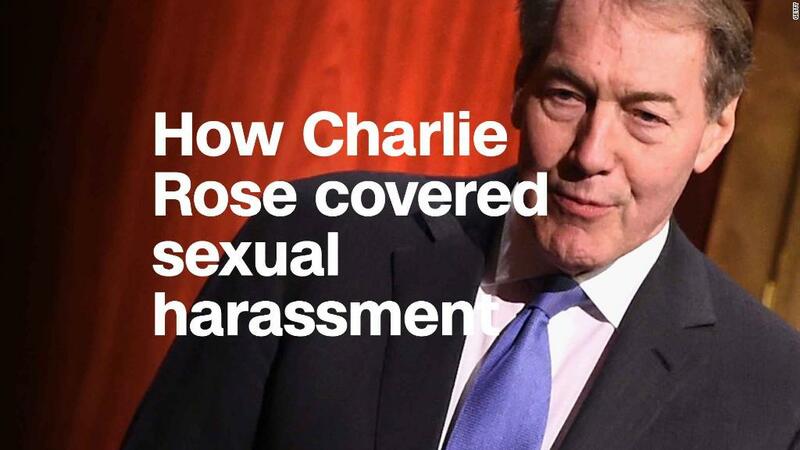 On November 9, Rose asked New York Times journalist Emily Steel, who broke the news that Bill O'Reilly had settled a series sexual harassment allegations, how corporations and institutions are changing in response to waves of accusations. "I mean, it's such a historic change," he said. "What is the emerging definition [of sexual harassment]?" Given how many men in the media industry have been accused of harassment and assault, Washington Post media columnist Margaret Sullivan told CNNMoney that it might be time to reconsider "who is telling our national story." "It is something to think about," Sullivan said. Some members of the media reporting on the issue of harassment "may not have had the equal respect for men and women, given what their actions may have been." Rose, in a statement, apologized for his "inappropriate behavior" and said he is "greatly embarrassed." "I have behaved insensitively at times, and I accept responsibility for that, though I do not believe all of these allegations are accurate," he said. "I always felt that I was pursuing a shared feeling, even though I now realize I was mistaken."